Raith Rovers failed to build on an encouraging pre-season as their first competitive match of the campaign ended in a dire Betfred Cup defeat to Cowdenbeath. The result was a major disappointment, but the bigger concern was that the part-timers, who finished bottom of the entire SPFL last season, were the better side for the majority. A hefty injury-list which included five likely starters - Lewis Vaughan, Lewis Milne, Liam Buchanan, Nat Wedderburn and Nathan Flanagan - certainly did not help matters. It meant Raith had several square pegs in round holes, and could only name two outfield substitutes, leaving manager Barry Smith extremely limited in options. The patchwork starting XI contained no fewer than six defenders, so it was perhaps unsurprising that the balance did not seem right, with two teenage full backs, one of whom just 17-years-old and making his senior debut, asked to play as wingers. If the small squad is already stretched to the limit on day one of the season then it does not bode well for the rigours of a long and testing League One promotion push. Further investment, whether in the form of loans or signed players, will surely be required. The lack of creativity on show perhaps reflected the players who were absent, but there were no excuses for the lack of desire in the team performance. After impressing in friendly wins over Championship opposition, Rovers seemed to forget that this was a cup game, let alone a derby, as their Fife rivals were by far the hungrier, more determined side. The match was Raith's first competitive fixture at Bayview, their temporary home while work continues on the new artificial surface at Stark's Park. The first half performance had a few bright moments, with only the crossbar preventing the 'home' side from taking an early lead, while Chris Duggan looked threatening at times without being able to provide a finish. The second half, however, was a tough watch as Raith were out-played in every department by a Cowdenbeath side who required a play-off win over Cove Rangers to preserve their SPFL status at the end of last season. Based on this showing, the Blue Brazil will be in for a better campaign under Gary Bollan. Raith almost took the lead in the second minute as Grant Gillespie's corner kick dropped to the feet of Dave McKay, another who was played out of position at right back, who smashed a shot against the crossbar. Duggan then passed up a glorious chance to open his Rovers account on nine minutes when he raced onto a ball over the top to go clean through on goal, only to blaze a wild left foot effort over the bar. After 15 goals for East Fife last season, Raith will be expecting the Aussie striker to produce more clinical finishes in these positions. 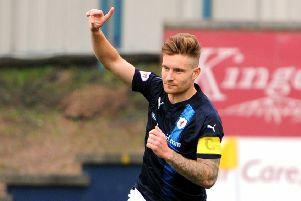 Thereafter Raith struggled to assert themselves with Cowdenbeath coming more into the game without troubling Robbie Thomson in goal. Duggan had another sight of goal on 25 minutes but snatched at his attempted volley after chesting down a cross from Euan Murray in the centre of the box. Duggan again posed a threat on 39 minutes when Kyle Benedictus strode out of defence to send him clear, but after cutting back onto his left foot, the striker's attempt was blocked for a corner. Cowdenbeath were beginning to win the battles and they finished the first half strongly with their best chance of the match coming four minutes before the break. A slip from Iain Davidson allowed Robbie Buchanan to find space in the box but Thomson was equal to his near post effort, turning it behind for a corner. The half ended with Raith boss Smith berating his defenders for sitting too deep, but if he was looking for improvements in the second half, he was to be left sorely disappointed. The away side came out the traps quickest and took the lead on 52 minutes when the hulking figure of Jordyn Sheerin barged Benedictus off the ball near the corner flag. It could have been given as a foul, but play raged on and Sheerin's attempted cutback was blocked by Davidson, only to fall back to his feet, and the striker, who was playing non-league football at Kelty Hearts for the majority of last season, fired past Thomson at his near post. Raith's response was muted at best, with a Gillespie free-kick from 30 yards, while on target, failing to trouble former Rovers stopper Dave McGurn, who was not required to call upon any of the heroics he so often produced when employed by the Kirkcaldy side. Rovers were unable to lay a glove on Cowdenbeath, who were dominant in defence whenever Raith tried to push forward, and if anything looked more likely to add to their tally, with only some last-ditch defending keeping them at bay. Deservedly so, the League Two side put the game to bed with five minutes left when Benedictus was woefully short with an attempted pass-back and Sheerin nipped in to fire home his second. Only 500 Raith fans turned out for this Betfred Cup opener, and they will have left unimpressed by their team's start to the campaign. In a group that already looked difficult to get out of, the defeat leaves Rovers with a mountain to climb to get to the knock-out stage of the competition. With a live televised game against Hearts to come next week, major improvement, and perhaps fewer injuries, will be required. Raith Rovers: Thomson, Watson, Valentine, Murray, Benedictus, McKay, Davidson (Stevenson 75), Gillespie, Matthews, Duggan, Nisbet. Not used: McGuff, Berry. Cowdenbeath: McGurn, Mullen, Talbot, Pyper, Marsh, Miller (Scott 75), Cox (Swann 89), Malcolm, Buchanan, Smith, Sheerin (Muirhead 90). Not used: Fotheringham, Goodfellow.